I honestly can't even begin to tell you how fab this service is. My family travels A LOT all year long. And at $20 a day to park at Philadelphia International Airport it TOTALLY stacks up. We recently got the opportunity to park at The Parking Spot and it was FABULOUS...in more ways than one. Why do we love The Parking Spot? 2) MUCH cheaper than airport parking. 3) A national brand so you know the security and service is top notch. 4) Complimentary bottled water. TOTALLY awesomeness. 5) Get a free day with every 7 days of parking with The Spot Club. 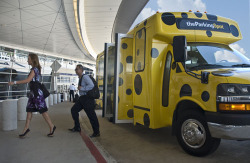 The Parking Spot is the nation's largest near-airport parking operator, providing parking and shuttle service at 24 airports around the country in distinctive spotted shuttles. The Parking Spot Network includes Parking Spot branded facilities at Atlanta Hartsfield, Austin Bergstrom, Buffalo - Niagara, Dallas Fort Worth, Dallas Love Field, Denver International, Houston Hobby, Houston George Bush Intercontinental, Kansas City, Los Angeles, Memphis, Nashville, Newark, New York JFK, Oklahoma City Will Rogers, Orlando, Philadelphia, Phoenix Sky Harbor, Pittsburgh, Port Columbus, and Lambert -St. Louis. The Parking Spot is now offering travelers up to 25 percent off parking as part of its "More Spots, More Savings" national promotion. With more than 37 locations at 24 U.S. airports, it's now easier than ever to take advantage of low airfares and plan a getaway. With frequent shuttles, complimentary bottled water and a generous loyalty program - The Spot Club - that earns travelers a free day after just seven days of paid parking, it's clear why The Parking Spot is the largest network of its kind. Where you park matters, and The Parking Spot offers an experience that will change the way you think about airport parking.